Hope you have all had a great Christmas and are looking forward to the New Year. I find it is always a strange time of year, we are all running around getting organised for THE day, it comes and goes the same as every other day of the year, but there is so much prep and organisation that goes into it, its no wonder that people get so stressed. Anyways I had to ask my hubby this morning what day of the week it was today, all mixed up. Not sure what day of the week Christmas day is suppose to be, but it doesn’t quite feel right that it was a Sunday this year. So last night in order to use up some of the left overs I decided to use a recipe in one of my new cook books, I received for Christmas, always a winner, buying me a cook book, I never have enough. So I opted for a recipe in Mary Berry’s Christmas Collection, Turkey Korma. It looked delicious on the plate, so it was time to test it out and see if it was a keeper. Just to digress a little, for me when I buy/receive a new cook book, if I make 1 recipe out of the book, then for me the book has paid for itself, don’t get me wrong it is not that I only have to cook 1 recipe, but I have to cook at least one and then it is a good one. Anyway back to the point. My hubby stripped the carcass of the turkey and the thighs and I had a lovely dish of cooked turkey for the base of this recipe. The other ingredients are really staple ingredients from the store cupboard except for the grapes, they were nice and added a little something to the dish when they popped in your mouth, however the recipe will be just as delicious without them. It was a matter of gathering the other ingredients together and getting started on the meal. A good curry always starts with lots of chopped onions, 4 medium onions, chopped and in the pot with some vegetable oil, I started them off slowly so that they were covered in the oil and starting to soften, then I put the lid on the pot and let them fry/steam in the pot for a good 10 minutes, I did check them a couple of times, just to make sure they were not catching on the bottom of the pot. While the onions were cooking, I peeled the garlic and I had some confit ginger, always good to keep some in the cupboard, I chopped it finely ready to be added to the pot. Once the onions were ready, I got the spices ready, ground coriander, ground cumin, ground garam masala and it was suppose to be ground cardamom, however I didn’t have any ground only in the pods, so I added 4 of them. So I crushed the garlic straight in to the pot with the onions, then the chopped ginger, I gave it a good stir and allowed it to cook for about 2 minutes and then 1 tablespoon of each of the spices into the pot another good stir and allowed it all to cook for about 5 minutes, just so the rawness of the spices were cooked off. I added the chicken stock and the coconut cream another stir and I left it to come to a simmer, once it was simmer for about 5 minutes, I added the turkey pieces, ground almonds and the grapes and then just left it to simmer away for about 10 minutes, I tasted it and the only thing it needed was some butter, so I added 1 tablespoon of butter and allowed it to continue to simmer until we were ready to eat it. All in all it was about 40 minutes simmering, I really think it benefited from this as the onions were all broken down, they had melted into the sauce and the sauce had thickened up slightly, just perfect. I am not a great lover of rice with a curry, I think it is nicer with a good naan bread. While the curry was simmering away I got to making the naan bread. This is a really easy recipe, no yeast involved, therefore no waiting time, Just mix everything together, roll them out, and fry, job done. It is really that easy, place all the dry ingredients into a bowl and mix through to blend them together, then measure out the milk and oil into a jug, make a well in the middle of your flour mixture and pour in 2/3rds of the milk and stir through, keep adding the milk until you have a dough ball, you might need to add some more milk, you should have a dough ball, not too sticky, when you are happy with the dough, remove from the bowl and gently kneed until you have a ball, cut it into 4 pieces and then using a rolling pin, roll them out, they don’t need to be perfect. 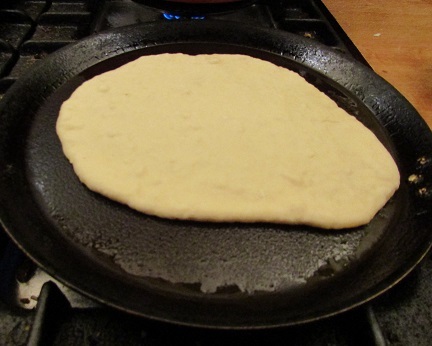 Take a frying pan and add a little oil, I used garlic oil, just to add a little extra flavour, then using the rolling pin, lay 1 naan bread in the frying pan and cook until you can see some bubbles coming up, usually about 3-4 minutes on each side. Take a peek at the cooked side and when you have some nice browned bits, then flip over the naan bread and cook the other side. Continue until all 4 breads are finished. When cooked add a little butter and spread over while hot, just to give that authentic taste. We just had big hot bowls, loaded the curry into them, tossed a little chopped parsley on top and used the naan breads to dip into the sauce, it was delicious. This is definitely one that we will be using again, any left over meat will do, however I will probably resort to trusted chicken in future. 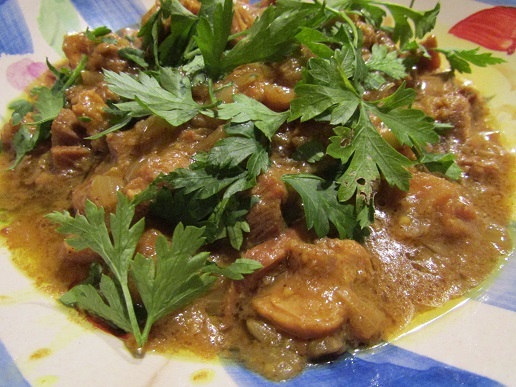 Delicious aromatic curry, ideal for using up left over meats or any meat of your choice. Peel and roughly chop the onions, medium pieces will do. In a large pot, add the vegetable oil and add the onions, mix them around until they are coated in the oil and cook for 2-3 minutes until they start to soften. Place the lid on the pot and allow to cook for 10 minutes, occasionally stirring to ensure they don't catch on the bottom of the pot. Once the onions are soft, add the crushed garlic, chopped ginger and stir to mix around. Then add the spices and allow to cook for 5 minutes, stirring occasionally. Place the stock pot into a jug and top with 300 ml of boiling water, mix and when dissolved add to the onion mixture. Stir the pot to blend everything, add the coconut cream and mix again. Allow the mixture to cook for 5 minutes until gently simmering. Add the turkey and grapes to the pot, then add the ground almonds and cook for another 10 minutes. Add the butter and allow to simmer until needed. Place the dry ingredients into a bowl, mix around to blend everything together. Measure the milk and oil into a jug, add 2/3rds of the milk to the bowl and mix with the flour, add the remainder of the milk as required, you may not need all and you may need more. Your dough should come together and be soft but not sticky. When you are happy with the consistency of the dough, remove to a floured work surface and kneed until it all comes together. Split the dough into 4 and using a rolling pin, roll out 4 naan breads. 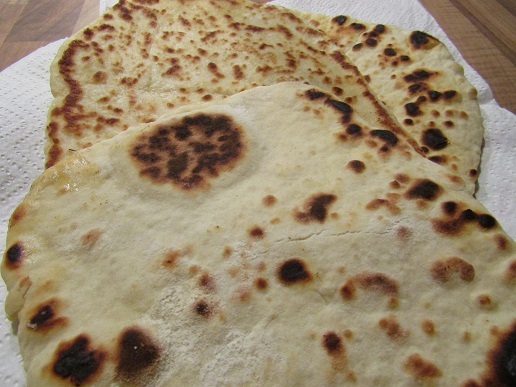 Using a large frying pan, place on the cooker and add a little garlic oil, when it is hot, add 1 naan bread to the frying pan and cook until it is browning then flip over and fry the other side. It should take about 3-4 minutes per side. 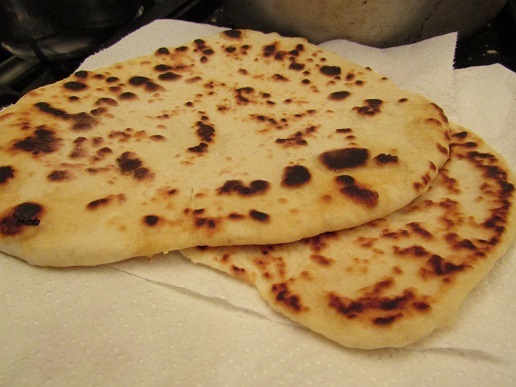 When the naan bread is cooked, spread a little butter over the hot bread just to add some authenticity. 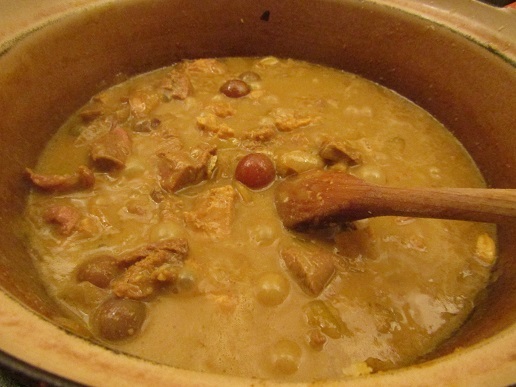 Give the curry a final stir and spoon into hot bowls. 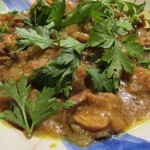 Top with the parsley/coriander and dip the naan bread into the sauce and enjoy. The grapes are optional, there was a nice little pop of sweetness as you bite into one, but they didn't really bring anything to the flavour of the curry. You can serve with boiled rice, however I prefer to just enjoy with the naan breads.